Our seas are suffering from overfishing, exploitation for resources, and damage to natural habitats. Marine Protected Areas – parts of the sea where wildlife and habitats are protected – are key to the future health of our seas, their ecosystems and wildlife. Marine Protected Areas (MPAs) are areas of the sea where human activities such as fishing are restricted so as to afford protection for habitats, particular species and ecosystem processes. 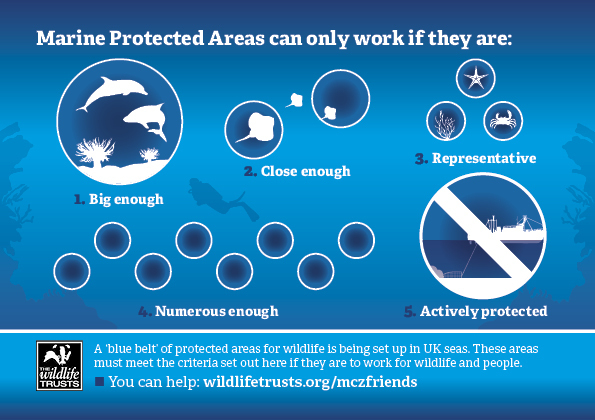 MPAs do far more than protect the wildlife found within them and are not simply closed off, no-take areas; they can have influence beyond their boundaries and are managed in a way which allow sea-users to co-exist and for activities to be conducted in a sustainable manner. The seas around Sussex and the surrounding Channel are heavily used by shipping, recreational users and maritime industry; they are also home to a huge variety of marine life and feature important habitats and natural features. For a long time our seas and the resources within have been taken for granted and subject to over-exploitation, pollution and direct damage. This has lead to destruction of habitats and the decline of species. For these reasons it is important that we afford protection to our marine environment, in order to avoid further damage, recover from past declines, and allow sustainable use of the marine environment.